Audiocore WH-6420U merupakan satu set mikrofon wireless yang berkualitas, tahan lama dan juga ekonomis dari brand Audiocore Instruments. Dengan jenis mik dynamic yang fleksibel dalam penggunaan dan juga penyaring suara berkualitas dapat mengurangi noise dan feedback sehingga suara Anda akan terdengar dengan jelas dan bebas distorsi. Audiocore WH-6420U menggunakan frekuensi sinyal UHF yang mampu menjangkau hingga diameter 120m dari receiver sehingga pergerakan Anda tidak terganggu ketika menggunakan Audiocore WH-6420U. Anda tidak perlu lagi khawatir frekuensi terputus oleh jarak ataupun interferensi sinyal lain karena Audiocore WH-6420U ini juga memiliki 64 pilihan channel frekuensi. Audiocore WH-6420U ini juga dilengkapi dengan kenop pengaturan volume untuk tiap-tiap mik pada receiver dan layar digital pada mikropon yang menunjukkan status mik Anda (kondisi baterai, frekuensi yang digunakan, dll.) memberikan kontrol penuh atas Audiocore WH-6420U. Sangat cocok untuk karaoke, rapat kantor, acara indoor/outdoor, outing, acara rumahan, gereja / masjid / rumah ibadah pengajian, acara warga dll. Audiocore Wireless Microphone UHF Seri WH-64 juga hadir dengan variasi mik bodypack clipon yaitu Audiocore WL-6420U. Audiocore WH-6420U is a high-quality, durable and economical set of wireless microphone from world-renowned brand Audiocore Instruments. With the versatile-in-application dynamic type microphone and high quality filter to reduce noise and prevent feedback, your voice will be crystal clear an free from distortion. Audiocore WH-6420U using UHF signal frequency that could reach up to 120m in diameter from the receiver so you can move freely when using this mic. You don't have to worry about disconnected mic for being too far or frequency interference from another signal because the WH-6420U have 64 channel frequency option. Audiocore WH-6420U also features independent volume control knob for each microphone and digital LCD display on the microphone that show your transmitter status (Battery level, Current frequency channel, etc.) gives you full control of Audiocore WH-6420U. Suitable for karaoke, office meeting, indoor/outdoor activities, outing, home usage, church / mosque / prayer house need, etc. Audiocore UHF Wireless Microphone WH-64 series also have another variety with bodypack microphone Audiocore WL-6420U. 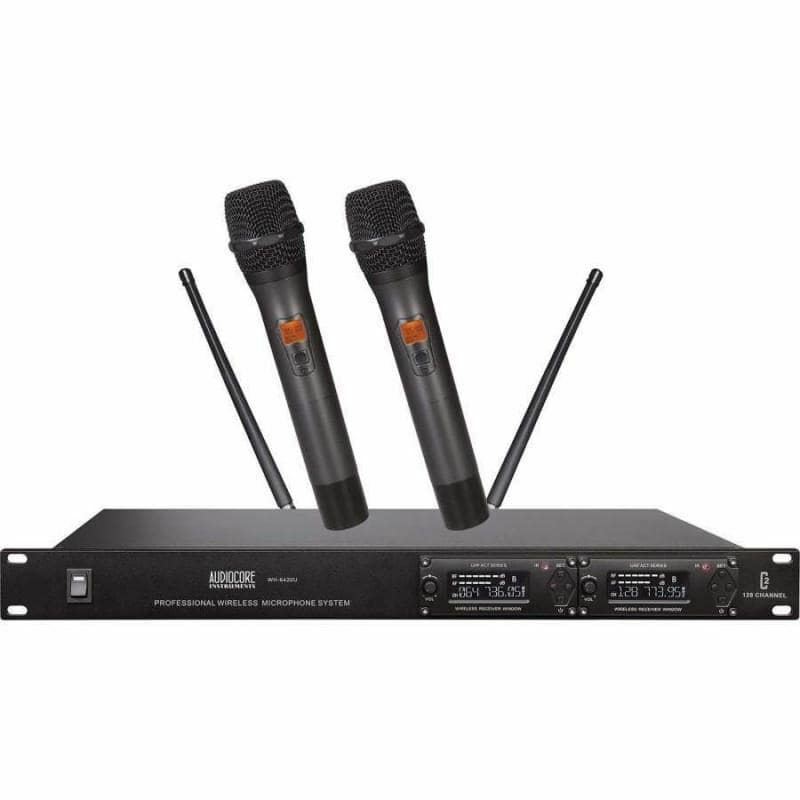 Line 6 XD-V75HS Professional Digital Wireless Headset SystemXD-V75HS Digital Wireless Headset Microphone System is a hands-free system designed for use in performance-critical live stage and presentation applications. Offering spectacular audio quality, XD-V75HS systems feature exclusive EQ filter m..
Shure FP25/SM58 Mic BroadcastThe FP25/SM58 Handheld Wireless System is part of the FP wireless systems family.When portability is required, FP Wireless and its intuitive, flexible components are the ideal solution. FP Wireless features proven wireless technology, including Shure patented Audio Refer..